This week, Katy Perry introduced her new purrfume, John St. launched the world's first Catvertising agency, classic movie posters were improved by felines, The Dapper Toad debuted a line of custom cat charms, Etsy hatter Notsokitty created cat hats that were out of this world, politico Hank the Cat conceded defeat in Virginia's Senate race, Patricia Field dazzled us with Glitter Kitty Wigs, an adorably fluffy kitten mesmerized thousands with its stubular cuteness, we learned how Belgium's Kattenstoet Cat Festival started out as a cruel tradition, that has transformed into a modern day kitty celebration, and things got serious when we met the cats. In other news, Catsparella got its own Google+ page (add me! ), and a button (grab the code from the left hand side of the page if you'd like to link to us from your own blog). Also, don't forget I have a fun giveaway going on right now to win a copy of the new Awkward Family Pet Photos book! Click here to check out out some hilarious kitty pics, and to enter for your chance to win. I'm drawing the winner this coming Monday, 11/14! 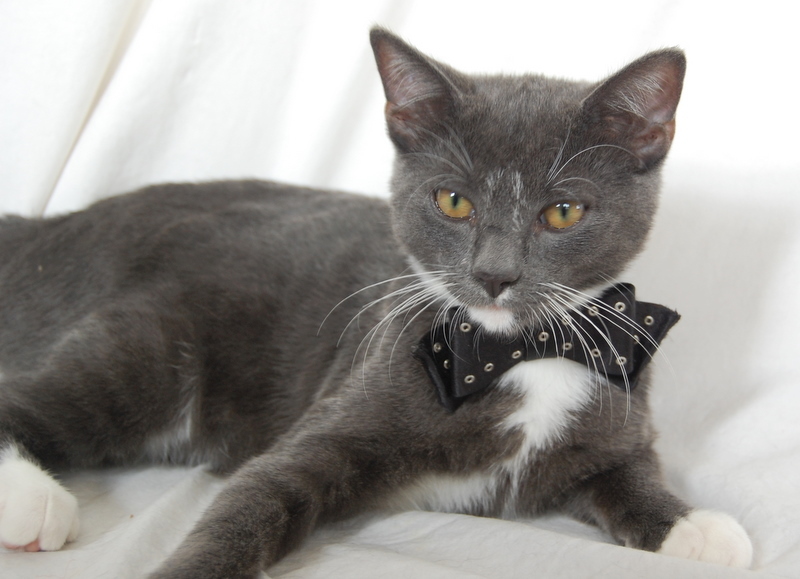 This week's featured feline is a gorgeous kitten, who can do tricks, has an affinity for his namesake, and aspires to become a model to help put some kibble on the table. "Jimmie Chew is a 5-month-old kitten we found outside. We already had two cats we adopted a few months ago, but couldn't find a home for the kitten so we had to keep him. Well, I convinced my friend that I would train the kitten and get him a job or two modeling to help pay for cat expenses. I'm not a trainer, haven't had a cat since I was in high school, but this little guy was just so cute and smart, I had to try. I snooped around the internet but there isn't enough free information on how to train cats, so I read all all I could find and the rest was common sense. We named him Jimmie Chew because he really liked to chew things from the moment he came inside. He is very bright and very nosey. So far he has learned how to walk on a leash, sit, stay, up, lay down, jump through a hoop, hold things in his mouth, and touch with his paw. We started a blog to keep track of all the pictures we took of him and his journey to getting a modeling job. As I get better at blogging, I'm doing tutorials on other blogs on how to train a cat (so far we did how to jump through a hoop and learning to walk on a leash). As I learn more about cats and cat care I will be posting how to make home made cat treats and anything I find interesting (like a bed we made for all three of them). As for getting Jimmie a job, it's turning into an adventure. The few agents that weren't crooks were creeps. I'm not giving up, we will be taking Jimmie to nursing homes and a day care center for a "cat show" and I am looking into volunteering with him somewhere." Special thanks to Ella for submitting the handsome little Jimmie Chew this week! Please be sure to check out his blog, and keep an eye out for this rising feline fashionisto, who will undoubtedly be coming soon to a catwalk near you! What a wonderful post about Jimmie Chew! He's already famous. :) And so very adorable in his bowtie. So nice to meet new friends!!! Love your cat news! Jimmie Chew - how adorable! Jimmie Chew was a good find! Move over Maru, there is now more cuteness for teh interwebz! We've met Jimmie Chew through his blog! But we never realized he was so talented!! Pretty dapper in his tux & tie!